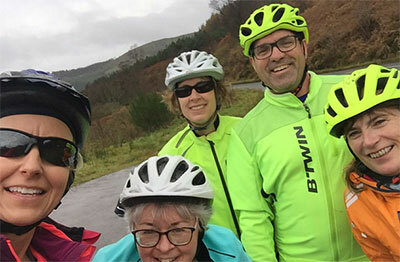 "Over the past couple of years, I have been part of a road cycle group, consisting of school parents from our local Crieff community, who meet twice a week to cycle. "One of the mums became a Christian through attending our local church and I felt challenged over the past year to meet with her, before our cycle rides, for Bible study and prayer. The amazing thing is that others in the group got to know about this and asked if they too could attend. So a group of us now meet each week and at the moment are working our way through the gospels. "It has been a wonderful opportunity to share my faith and every week there is lots of lively discussion! We also entered a team, along with some husbands, for the Christians in Sport Quiz which was hosted by some of the local churches. Again, this was a great night and provoked good conversation. "I would encourage anyone involved in sport, no matter what age you are, that there are always plenty of opportunities to share your faith."